The nine-year-old is almost certain to return to Aintree. 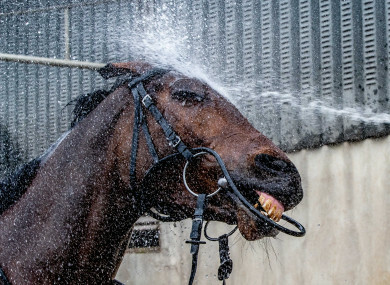 Tiger Roll getting washed after morning work. IT ISN’T a prerequisite of the ‘People’s Champion’ mantle for the beast in question to be an equine everyman, an underdog, or underhorse if you like, who beat the odds by virtue of his surroundings. But it helps. Danoli is the archetypal example, the first racehorse ever owned by Dan O’Neill, a man who is a hero to many throughout the country for the healing hands that have brought thousands flocking to his Myshall home for decades to cure back ailments and set bones. The son of The Parson was bought as a three-year-old at Goffs in 1991 for what was even then, a reasonably affordable sum of 7,000 guineas from his breeder Willie Austin, by a farmer who was turning his hand to training; a most lovable man named Tom Foley. When Danoli went to Cheltenham and sent Irish punters into raptures by winning the Sun Alliance Novices’ Hurdle as a heavily-punted favourite under Charlie Swan, Foley happily admitted that he had boarded a plane for the first time as a near-50-year-old to be there with him and that it made him very sick indeed. He was self-contained enough to admit too that he was learning about training racehorses as he went along and would undoubtedly make mistakes. Tom Foley was true to himself, his background and where he came from. Foley is battling cancer at the moment, in the same matter-of-fact manner in which he has approached everything else in life. It’s there to be dealt with and he has been doing so for a while now. The 73-year-old was in for chemotherapy on the 25th anniversary of Danoli’s Cheltenham glory last week but still had a runner on Sunday – All About Alfie was third. Danoli was blue chip People’s Champion. His background and punter-rescuing feats early on assured that. His comeback from career- and indeed life-threatening injury cemented it, the favourite of the masses in victory and defeat because he so clearly hated the latter and yearned for the former. He wore his considerable heart on his forehead, and spread it to his four hooves. Tiger Roll is owned by a man who will break all the records for winners trained by the time he is finished. Gordon Elliott’s Cullentra House houses more than 200 racehorses and Elliott has already bagged most of the top prizes in his sport despite being in his early 40s. He is the son of a panel beater who has gotten where he is by dint of hard work, ambition and ability but he is now a standard-setter, with considerable resources to call upon. Michael O’Leary, the billionaire boss of Ryanair and Gigginstown House Stud, supplies the lion’s share of those resources and owns Tiger Roll. Yet we love Tiger Roll. Why? Because of his journey. He has his quirks, or had. Fell out of love with racing at least once, probably twice. He was bred on the banks of Tipperary’s Lough Neagh by Gerry O’Brien to be a flat horse, sired by a Derby winner Authorized. John Ferguson bought Tiger Roll for Sheikh Mohammed from O’Brien for 70,000 guineas. He spent time under the stewardship of disgraced trainer Mahmood Al Zarooni, who was then warned off for eight years after admitting to doping some of his racecourse representatives with steroids. Tiger Roll never saw the track and was sold by Godolphin to Nigel Hawke for a measly £10,000. His stock soared quickly when he bolted up in a juvenile hurdle at Market Rasen, where they now have a bar named in his honour. Mags O’Toole forked out £80,000 for Gigginstown and he fulfilled his primary task in winning the Triumph Hurdle for his new connections in 2014. As is often the case with four-year-old hurdlers, the following season was difficult, with the notable exception of an October victory at Cheltenham, where he has actually prevailed a total of five times — four at the famed festival. The switch to chasing yielded a modicum of success but in a stroke of genius, Elliott put this flat-bred charge into the four-mile National Hunt Chase, three years after winning over half the trip around Prestbury Park. Lisa O’Neill hung tight as he paid scant respect to a number of obstacles and the pair romped home. The Tiger was pulled up in two of his next three races however, so once more, Elliott changed tack and opted for the cross-country route. He hasn’t looked back, claiming Cross-Country Chase at Cheltenham last year and following up with that dramatic Aintree Grand National success. Last week, after destroying a strong field in the Cross-Country Chase to prevail by 22 lengths, he received an ovation that at least matched that of the sensational Altior, who in winning the Champion Chase, had set a new record for consecutive victories by a jump horse. So yeah, he’s a People’s Champion. Probably THE one. “He’s great, he’s bouncing” said Elliott at the Boylesports Irish Grand National launch he hosted yesterday. And the main news to emerge from the briefing was that despite O’Leary’s brother Eddie intimating to the contrary, Tiger Roll is almost certain to return to Aintree in a bid to emulate Red Rum, the last horse to garner two consecutive Aintree Grand Nationals in 1974. Indeed no other horse has won it multiple times, the great Rummy landing the spoils for the third time 42 years ago. Depending on what happens in Liverpool, the nine-year-old Tiger Roll may also show up to try gain the big part of the €500,000 on offer at Fairyhouse. General Principle, who gave Elliott his first success in the race, and Dounikos, are two that are more likely to run in both however. “The plan is to go to the English National. Obviously I’ll have to discuss it with Michael and Eddie but he’s come out of the race very well so I can’t see any reason at the moment why we won’t be going there. “I spoke to the English handicapper yesterday and he said he put him up eight (pounds) for winning the cross-country race. He said he might have been easy on him, he could have put him up 10 or more very easy but because it was a cross-country race he put him up eight, so that only leaves him a pound wrong with last year (having initially been on a nine-pounds higher mark than last year prior to Cheltenham). It looks like he’s a better horse this year than last year. The Irish Grand National is a race Elliott always coveted, with Fairyhouse being his local track. He recalls Maid Of Money being paraded after her 1989 triumph by her late trainer, John Fowler (brother of Jessica Harrington, whose own Our Duke claimed the garlands in 2017, when none other than Tiger Roll showed a distinct lack of interest before being pulled up) and though he never rode in the National itself, had plenty of spins around the track. Fairyhouse provided Elliott with his first Grade One winner, Jessies Dream doing the business in the Drinmore Chase in December 2010. General Principle’s victory last Easter Monday was the highlight at the venue, in the most dramatic of Irish Grand Nationals, stablemate Folsom Blue looking the likeliest winner until being severely hampered jumping the last. “When they went by the line, I didn’t know what horse was what, it was that wet and murky. Gigginstown had that many runners in it, I wasn’t sure what colour cap was coming. It was great to win it, Irish Grand National, your family is there. If Tiger Roll were to arrive, it would be standing room only. Yeah, he may have a billionaire owner and be trained in the most salubrious facility you could imagine for a national hunt horse, but we adore him. Next stop on the Tiger Express, Aintree. Email “Tiger Roll set for Grand National repeat in bid to emulate the legendary Red Rum”. Feedback on “Tiger Roll set for Grand National repeat in bid to emulate the legendary Red Rum”.